India, a land with a wealth of culture, history, tradition, beliefs and arts, is a vivid cornucopia of stories and knowledge. Its polychromatic character — whether obvious as literal colours or concealed in the abundance of thought — invites a viewer to absorb the country as a journey forged of many individual experiences. Undeniably India responds, in the most unique way, to the human longing to know the world. And a valuable fraction of India’s wealth is brought to our doorstep yearly by the India by the Nile festival, whose fifth edition (8 March-27 April) took place across several cities. Organised by the Embassy of India in Egypt and Teamwork Arts, India by the Nile is the biggest foreign arts and culture festival held in Egypt, and it provides a platform for collaboration on the level of thought, art and even sports between the two countries. This year, India by the Nile 2017 coincided with the 70th anniversary of India’s independence and the establishment of diplomatic relations with Egypt. Extending its reach, the festival staged its offerings in Cairo, Alexandria, Ismailia and Port Said in a much larger number of venues than in previous rounds. The venues included the Cairo Opera House, the Hanager Arts Centre and the Midan Theatre, Semiramis InterContinental Hotel, Lycée Al Horreya in Zamalek, Ain Shams University, the British University in Egypt, Al Azhar Park, the Child Museum in Heliopolis, the Maulana Azad Centre for Indian Culture (MACIC), India House, Misr Public Library, the Children’s Cancer Hospital 57357, the Light and Sound Theatre in Giza, the Sayed Darwish Theatre (Alexandria Opera House), the Bibliotheca Alexandrina and cultural palaces in Port Said and Ismialia. This truly impressive list enabled audiences representing a wide variety of backgrounds and generations to enjoy India by the Nile. Expansion was also obvious in the programming. While in previous years the event was three or four weeks, this year India by the Nile was seven weeks. The many segments of the festival ranged from dance, music, theatre performances and a Bollywood dance workshop to presentations of crafts and photography. The festival also included well-being sessions, sports activities, a food fiesta and even economic seminars. In several of those events, the festival encouraged and showcased cooperation between Egyptian and Indian cultures, emphasising the history of relations between the two countries. Previous editions of India by the Nile always included a large-scale Bollywood show, attracting a large audience to the Cairo and Alexandria opera houses. At the same time, the Mumbai-style extravaganza extended to the Bollywood dance workshops led by the India-based French choreographer Gilles Chuyen. This year, the festival’s programming kept the dance workshop yet for the first time, the performance did not take place. However, the festival did not omit screenings of a selection of Indian films defining the 1980s, 1990s and 2000s, at Porto Cinema in Cairo (15-19 April) and featured ‘In Conversation’ with actor Vivian Dsena. One had had an impression that with a large segment of the Egyptian population following India’s film industry, its stars and music, the dance show was a vital component of the festival’s success, and a corridor leading the audience to other art forms. But this assumption turned out to be wrong! India does not need a flashy extravaganza to reach the audience’s hearts. Its power lies in the arts it presents and an intelligent outreach methodology. The beauty stemming from India’s cultural reservoir, whether in the form of popular shows or seemingly esoteric art, has the power to find a common language with each spectator or participant. No doubt India has a particularly photogenic culture, even if it is not uniform. But India by the Nile engages with the community and brings over many state-of-the-art performances, renowned dancers and actors, the best representatives of India’s art. Suffice to say that many of the artists we are privileged to watch in Egypt are internationally renowned and have been praised by the most demanding international reviewers, including critics who are well acquainted with arts of India. If thousands of faithful Egyptians are lured by the Bollywood industry, India by the Nile has managed to invite the audiences and make them enjoy many other art forms as well. Throughout the weeks of March, the festival employed a range of dynamics to provide a variety of cultural components. The Crafts Mela (8-14 March), which opened the festival, featured the national award-winning Indian artisans, first on the Giza plateau, then at other locations across Cairo. 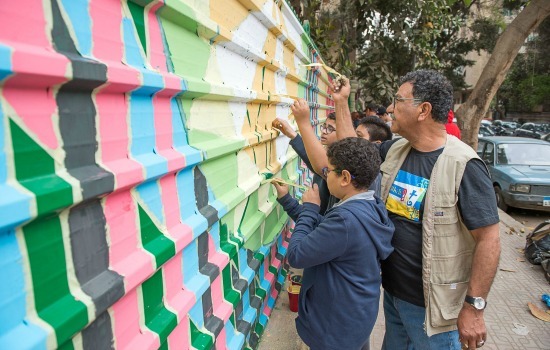 Living Walls (27-30 March) had artists Mohamed Abla from Egypt and Yogesh Saini from India lead young people through creative expressions on the wall of Lycée Al Horreya in Zamalek, Cairo. A high dose of energy was delivered through the few days of Bollywood dance workshop in Cairo and Alexandria. The same cities also witnessed a series of holistic yoga and well-being sessions. On another note, an economic seminar titled “India-Egypt Economic Engagement in a Globalised World” was held at the British University in Egypt (30 March). April opened with the Women of Substance reception (2 April) held at India House. This year the event shed light on notable Egyptian ladies in recognition of their exceptional achievements in the fields they represent. The impressive list of 11 honourees included Azza Faiad, a young scientist who turned trash into biofuel; Heba El-Sewedy, the founder of Ahl Masr Foundation for burn victims; and Yasmin Helal, the founder of Educate Me for underprivileged children; among others. The following days addressed the other senses, offering Indian cuisine (3-7 April) with chef Vikram Udaygiri at the Semiramis InterContinental. A higher dynamism was introduced with the Kettle Drums Project visiting Cairo and Ismailia (4 and 5 April) while the visual arts returned with the exhibition Images of India by Ashraf Talaat (9-13 April), featuring photographs taken during his visit to India. This year’s edition also brought a new component to the festival through friendly matches between Egyptian and Indian football teams (21-24 April). The second half of April focused on the performing arts bringing four remarkable events to Cairo and Alexandria: Aditi Mangaldas and Drishtikon Dance Foundation gave a contemporary scent to classical Kathak in Uncharted Seas (18 and 22 April); world class violinist Dr. L. Subramaniam offered a fusion of Indian and world music (19 and 20 April); Vanashree Rao and her company the Kuchipudi Dance Academy performed Dramatic Tales, classical dances from India’s South (18-23 April); while the Ishara Puppet Theatre Trust gave their iconic show Images of Truth in Cairo and Alexandria, topping it with a special show at the Children’s Cancer Hospital 57357. It would be impossible to cover all four performances. But it is safe to say that on the artistic level, they made up a festival within the festival, a true cherry on top of India on the Nile. Each performance stretched the boundaries of art while creating fascinating conversations between past and present, tradition and modernity, asking questions about what is history versus contemporary and the positioning of a human being within an ever-evolving creativity. Among the events that requires special attention was the violinist and composer Dr. L. Subramaniam who performed at the Cairo Opera House on 19 April and at the Bibliotheca Alexandrina the following day. He was accompanied by musicians on keyboards, guitar and percussion instruments including mridangam and morsing, and later a harp. Dr. L. Subramaniam’s biography, published on his website, reveals that “over the years he has written and created works for the world’s greatest orchestras including the New York Philharmonic Orchestra and Zubin Mehta (Fantasy on Vedic Chants), the Swiss Romande Orchestra (Turbulence); the Kirov Ballet (Shanti Priya), the Oslo Philharmonic Orchestra (The Concerto for Two Violins); the Berlin Opera (Global Symphony), the live concert of which was broadcast simultaneously over 28 nations for millions of people.” He has performed across the globe and has over 200 recordings in his artistic repertoire. Those and many more statements coming from international critics give a unique weight to the musician. Yet it is enough to look into several videos documenting Dr. L. Subramaniam’s performances across the globe or, even better, to attend his live performance, to understand what generates this renown and admiration. Born in 1947 to a family of artists, Dr. L. Subramaniam excelled in Carnatic music, associated with southern India. His openness to international cultures, such as Western classical music and jazz, his imagination and a great sense of improvisation all allowed him to create the most creative musical marriages, where Indian ragas (scales) meet Western harmonies. Watching the violinist on stage where the instrument becomes an extension of his own breath, we find many personality traits in one man: rapturous ardor and poignant passion, intensity of expression and soothing melancholy. As he converses with his violin, Dr. L. Subramaniam’s fusions become a natural representation of the world’s joint history where his Indian roots lay the groundwork for many intriguing adventures enveloped in brilliant technique, and capturing the limitless concepts of music and art. One such adventure was presented during the second half of his performances in Egypt, where he was joined by the Egyptian harpist Amira Hamed in a wonderful creative dialogue. The festival also featured Vanashree Rao, the Indian classical dancer who came with her company Kuchipudi Dance Academy presenting dances from the India’s south: a classical dance-drama, Kuchipudi, and classical Bharatanatyam and Chhau, a dance with folk and martial origins. The performance titled Dramatic Tales presented elements of Indian mythology that depicts gods, goddesses and demons within a complex network of love and destruction. In previous years, India by the Nile’s dance department presented mostly the country’s north and east. 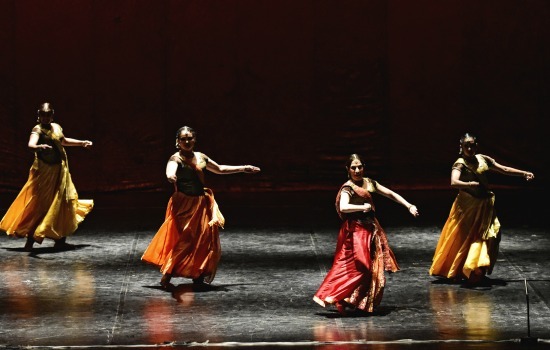 We saw Kathak (from north India) with a few renowned names gracing our stages, and Aditi Mangaldas shining this year, Odissi from the eastern coast and Manipuri dance from the north eastern state. The south was represented rather outside India by the Nile, when Kathakali dancers led by Kottakkal Rajumohan told their stories in August 2016, during the Bibliotheca Alexandrina’s International Summer Festival as well as in Port Said, Ismailia and Cairo. Kuchipudi, Bharatanatyam and Chhau was an opportunity to get yet another glimpse of the riches of the country’s south. After seven weeks of intensive activities, India by the Nile had to close with an event that would remain in the audience’s mind for months or even years to come. Giving this responsibility to the Ishara Puppet Theatre Trust which brought the Images of Truth (Satya Ke Pratiroop) performance proved a perfect choice. 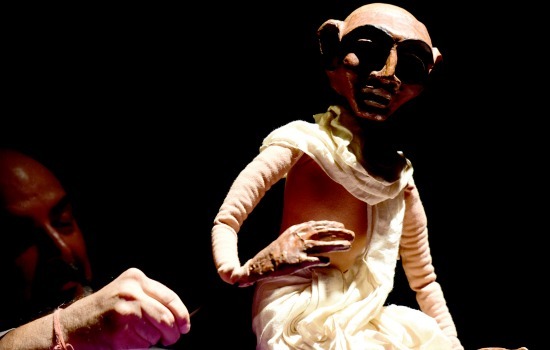 Founded in 1986 by Dadi Pudumjee, the Ishara Puppet Theatre Trust is “one of India’s leading contemporary puppet theatres, committed to creating awareness, exposure and education to the multifaceted traditions and techniques of puppetry in India and the world,” we read in the theatre’s notes. The troupe has garnered numerous accolades and is known to bring to light many social issues in their work.Images of Truth, one of the troupe’s most successful shows, is a non verbal musical performance created in 1993. Addressing young people and adults alike, the performance uses marionettes and hand puppets, fusing them into the presence of actors and dancers, and adds simple props and dynamic music, to depict in 50-minutes the life of India’s iconic figure Mahatma Gandhi and the concept of satyagraha (nonviolent resistance). There were many remarkable moments in the show including powerful contrasts that aimed at shaking our perception of truths that surround us. When dehumanised humans and small puppets that are just meaningless props in the hands of ruthless politicians are set against a humorous backdrop, the tragedy of the situation is emphasised. When two clowns play a seemingly funny charade portraying the relationship between an upper class caste and the working caste enslaved by it, we are left with bitter feelings about humanity. And when Gandhi manages to resist despite humiliation, we regain our faith in satyagraha. It is the simplicity of expression, conceptual depth captured with neat theatrical aesthetics that makes Images of Truth one of the most remarkable components of this year’s India by the Nile. But the Ishara Puppet Theatre Trust’s performances were not limited to the frequently attended venues, in Cairo and Alexandria. The puppeteers also visited the Children’s Cancer Hospital 57357 with a different performance, bringing a much needed smile to the young patients’ faces. This was the first time a puppet theatre made it into the programme, and the idea has obviously enthralled the audience. The event also awakened in us a long forgotten need for this kind of art, which though strongly embedded in its country’s history and values, uses a captivating modern vocabulary to pass its ideas and aesthetics onto the viewer. Though Egypt has its share of puppet theatre, and history of this genre conceals many wonders, the more frequent contact with international puppetry will help a young generation of Egyptian artists to move forward as well as it will provide many important values and delight to the audience. Without a doubt, the Ishara Puppet Theatre Trust created a memorable closing to the longest India by the Nile yet. In the end we are left wondering: with this year’s edition providing so many gems, and spanning so many venues, what else can the organisers bring and how can they impress us further in 2018? But if we take into account India’s wealth of culture, and how deep its reservoir is, we might still expect numerous remarkable shows and seminars. And as we wait for next year’s festival, India will continue to bring its arts to Egypt, the next Tagore festival (8-12 May) in Cairo and Alexandria being the nearest proof of the fact.